Reception: May 4, 2018 | 5:00 – 9:00 p.m. Artist Talk: May 17, 2018 | 6:30 – 8:00 p.m.
Alan Larkin conceives and constructs magical worlds. Not quite in the Academic tradition, nor fitting neatly into Realist, Magic Realist, Romantic or Pre-Raphaelite conventions, Larkin’s work blends qualities from all these genres. His paintings, drawings and prints embrace the dramatic spotlighting techniques of Dutch 17th Century painters; capture the mystery of the Magic Realists; and evoke the romance of the Pre-Raphaelites. In Larkin’s still life work, a menagerie of characters, large and small, converge to tell a story, incite emotion, and bewitch the viewer. Walk into Alan’s studio and meet the extensive cast of small beings he has amassed to work with him, drawing forth the feelings, telling the tales, and setting the stages he envisions. Like the director of a movie, Larkin weaves an intricate plot: a head turn here, a shadow there, figures receding and advancing – playing their parts amidst a glory of color and light. Larkin begins his still life paintings by first setting up the objects in a neutral staging area. Elaborate lighting, using color filters and multi-directional lamps, establishes the intended mood and becomes integral to the design. The tableau is then photographed by the artist, adjusted, and expanded with chosen backgrounds, patterns and details. This becomes the blueprint for the final painting, which is roughed onto the canvas and meticulously completed over a number of days or weeks. During this phase, the textures and surfaces emerge; a unique palette is developed; the composition takes shape; and the final splendor of the work unfolds. An artist with highly developed draftsmanship skills, Alan Larkin’s ability to interpret and depict reality in any way he chooses is uncanny. Familiar objects take on new personas, becoming endearing or ominous when viewed in an altered scale and combined strategically with other out-of-context players in the drama. Surfaces become true to life: brass is brass, velvet is velvet, a bird wing is seemingly soft and downy to the touch. 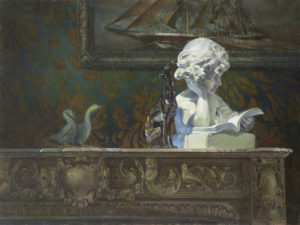 Take for example, the painting, Voyage, in which a plaster bust of a young girl becomes the centerpiece of a reader’s fantasy. A sailing ship takes her out of place and time, along with her small, rapt companions. The scrupulous detail of the carvings on the mantle causes them to look like they will leap off and join the fun while also anchoring the viewer’s attention to the immediate foreground. Wonderland finds another young heroine, in pink, wandering through an enchanted forest with her brass pig. Almost invisible, a woodland faerie emerges from the trunk of a tree. The painting is offset, both visually and narratively, by the benign (is it?) putto. The ambiguity of the scene invites the viewer to write the ending. Larkin’s figural work is just as lovingly rendered as his multi-layered still lifes. Drawn from life, this body of work exhibits the same careful attention to light, palette and design. Often simpler in arrangement, the figurative paintings are no less evocative – emitting a sensuality and sense of peace, sometimes co-mingled with innocence and psychological tension. Witness the scene in the pastel, The Knife, in which the soft skin tones and gentle expressions of the young women stand in stark contrast to the looming menace of the clutched weapon. In printmaking mediums, Larkin’s work also reaches a pinnacle. The etchings, for example, are complex narratives, drawn with masterful skill. Details are, quite literally, executed under a microscope, making each print a journey of discovery. Alan’s love of craft and creation is evident in all his work, regardless of medium or subject, and the viewer is impelled to experience the joy, pleasure and drama of both the artist and the story he is telling. Skill, craftsmanship, brilliantly conceived compositions, complex lighting, stunning but unpredictable palettes, and, above all, keen intelligence, combine to produce exquisitely beautiful works of art which are highly original, contemporary and timeless. I was a chemistry major when I went to college. I loved organic chemistry and was pretty good at math too, but I found myself spending more time in the studio than solving the problems from my text books. My father who was an artist had suggested that I take a drawing class, something that ultimately resulted in the big change that has eventually led me here to this series of pictures and this catalogue. The love of drawing eventually made me into an artist. It was my father who had earlier introduced my brother and me to the history of art by taking us as kids to Europe on a tour of the major museums. My earliest inspirations came from historical rather than contemporary art. While my artistic trajectory has changed gradually, from the pursuit of the how to the search for the why, it has really been like falling in love over and over again, first with one thing and then with another. Though this has resulted over time in an eclectic merger of interests, it is one that has been carefully meshed into a consistent practice. My mother was very influential too, by the way. My father made the art, but it was my mother who hung it up. My dad’s work was only a part of her art form. She was the aesthetic dictator of the home. If you were to boil down my mother’s theory of interior design, it would basically be that if you love a piece of furniture you ought to be able to include it in your house. The house was a destination for the fulfillment of a broad range of desires. As a metaphor for picture making her ideas resulted in my belief that simplicity in art is rather thin soup for the soul. Eclecticism good, minimalism bad. You could maybe love it but you couldn’t live in it. I find that the contemporary obsession with politics in art is as tragic as contemporary politics itself. While I have strong political views, I find that many crucial issues are not as simple as the strident would have us believe. Political art just fuels the fire. This really isn’t the need that art should be meeting. Art should be more like food less like Fox News. My exposure to science taught me to view art as a problem-solving activity. All my pictures are considered responses to visual problems. I like them to be rich in visual stuff and crafted with an eye to telling a good story. The best works ask people to search for interpretations but don’t put them out of reach. I strive to create pictures that are an emotional conduit. At their best they can be sad, brilliant or sensual, but always as complex as any human being. They might elicit a tear but not necessarily give you a pat reason as to why. Art, like writing about art, ought to be plain spoken enough that it rewards people who make the effort to understand. His work may be seen on the web at www.alanlarkin.net.